This is a USDA-SCRI funded Coordinated Ag Project with a research and extension team from Michigan, Washington, and New York.¬† Our goal is to develop and evaluate a solid-set canopy delivery (SSCD) system for apples and cherries. Solid Set Canopy Delivery Systems: an efficient, sustainable and safer spray technology for tree fruit. ¬†Our Standard Research and Extension Project addresses 3/5 of the mandated SCRI focus areas with a majority emphasis on: ¬†new innovations and technology, including improved mechanization and technologies that delay or inhibit ripening and efforts to improve production efficiency, handling and processing, productivity, and profitability over the long term. The multi-region project has a national scope completing the development and delivery of Solid Set Canopy Delivery Systems (SSCDS) for high-density tree fruit production and evaluate SSCDS spray coverage for additional perennial fruit crops. 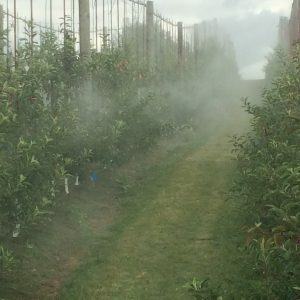 SSCDS consist of a network of microsprayers positioned in the tree canopy/trellis and connected to a pumping/mixing station. SSCDS application virtually eliminates applicator exposure common to tractor-based sprayers, while increasing farmers‚Äô ability to apply sprays during critical weather periods. SSCDS would make frequent applications at low rates possible for modern agricultural chemicals, including nutrients and reduced-risk pesticides, to improve efficacy of ‚Äúsoft impact‚Äù IPM programs and reduce soil fertilizer levels. SSCDS will help ensure that US growers remain competitive in an increasingly globalized marketplace. The specific objectives for this proposal are: 1) Optimize SSCDS technologies for modern orchard architectures for improved spray material application efficacy; 2) Determine and test SSCDS applications for standard and novel fruit production operations; 3) Determine the economic benefits and costs associated with SSCDS and identify non-economic barriers to grower adoption of SSCDS; and 4) Develop and deliver extension and outreach activities and materials ‚Äîincluding field scale and on-farm demonstrations‚Äî to increase producer knowledge and adoption of SSCDS technologies. Example of apples in Michigan getting a water coverage trial using a Direct Delivery System. SSCDS 2017 Field Season has begun!